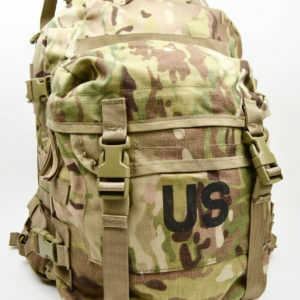 The BAE SYSTEMS Assault Pack can be attached directly to the MOLLE main ruck system or worn as a stand alone patrol pack. 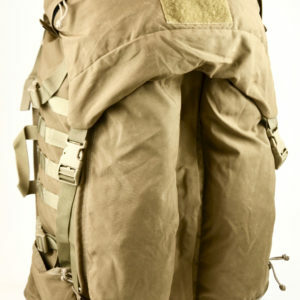 With a total capacity of over 1700cu inches the pack consists of a large main pocket, a zippered front cargo pocket (large enough to accommodate 3 ~ 4 complete MRE packages, NVG’s in a hard case or the snap-in 6 magazine bandoleer (available separately) and separate exterior hydration sleeve. Within the front cargo pocket is also a small utility pocket with Velcro flap closure for smaller items. The pack features a separate exterior slot pocket to integrate with hydration systems. The interior main compartment integrates with communications systems which accommodate attachment of the internal pack radio pouch (available separately). 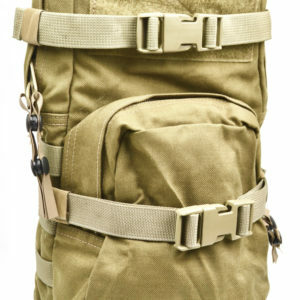 MOLLE attachment points along the padded shoulder straps with quick-ditch buckles. All packs come with Plastic Stiffener and Black Foam Pad.